Now shipping - first time in print since 2009! Sadly, the label that originally released Faces in the Rocks disbanded just as the album’s momentum was secure. The first pressing of the CD sold out, there was no vinyl pressed whatsoever, and the master recordings were lost in the shuffle of legal wrangling. Years passed. Mariee released an EP with Bonnie 'Prince' Billy, and a sophomore solo LP, Gift for the End, followed shortly afterwards. She toured Europe and the U.S. extensively; her fans kept asking for Faces in the Rocks. With their support, Mariee successfully mounted a kickstarter campaign to buy back the rights to her recording...and the rest is history. 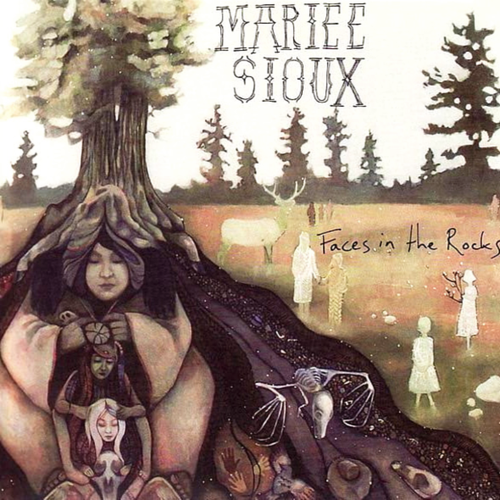 Now, with the help of Whale Watch Records and Almost Musique, Mariee Sioux's groundbreaking debut will see the light of day once more.